Prime Minister Justin Trudeau visited Winnipeg to make a $2.5 million funding announcement for Winnipeg Transit. A news release from the Prime Minister’s Office says the money will be used to upgrade the Fort Rouge bus garage on Osborne Steet. The upgrades involve replacing the facility’s roof and ventilation system, the installation of new overhead doors for the truck servicing bay, the replacement of up to four hoists, and the purchase of new transit shop equipment. The city of Winnipeg is chipping in an additional $2.8 million. Trudeau’s visit comes as questions swirl about the resignation of former federal Justice Minister and Attorney General Jody Wilson-Raybould from his cabinet. Wilson-Raybould announced Tuesday morning she left her post as Veterans Affairs Minister amid questions over whether she was pressured by the Prime Minister's office to abandon prosecution of a corruption and fraud case against Quebec-based engineering firm SNC-Lavalin. 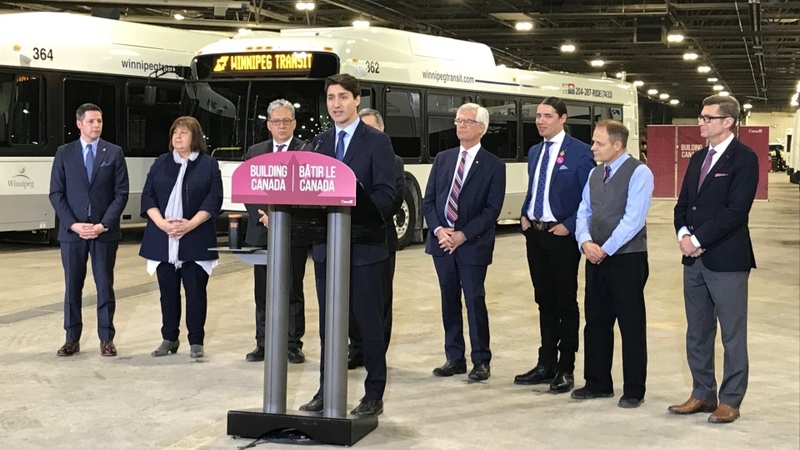 The federal government will invest $2.5 million to upgrade Winnipeg’s bus maintenance facility, Prime Minister Trudeau announced Tuesday.